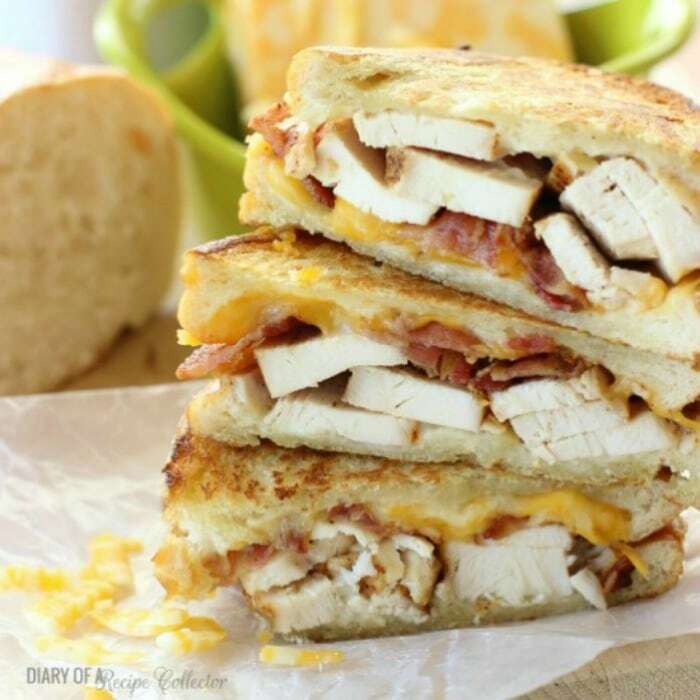 Garlic Cream Grilled Chicken & Bacon Paninis – Thin slices of grilled chicken, crispy bacon, and Colby Jack cheese piled onto sliced loaf bread spread with a garlic cream sauce and grilled until golden brown. So I’ve posted my fair share of sandwiches on this blog. What can I say? We are sandwich eaters in my family and not the regular plain ol’ kind. I’m talking about a really gourmet-style sandwich piled high with fixings and served on bakery-style bread. I love coming up with new sandwich creations, and paninis have a special place in my heart. The first time I made one when my husband and I were first married, I was immediately sold on the whole concept of a grilled sandwich. I’ve always been a grilled cheese fan, so it is only natural that my love would extend to a panini of any sort! This particular panini came about after I made a Grilled Chicken & Bacon Pizza which is a really popular recipe on my blog. I love recreating recipes! Pretty much anything can be made into a sandwich. Plus, there is no need for a panini press! Just press it down with another skillet, and you are good to go! Make garlic cream sauce: Heat olive oil and butter in a small sauce pan. Add garlic and saute over medium heat for 1 to 2 minutes. Add flour and stir for 1 minute. Lower heat to medium-low and add milk and stir to prevent lumps. Season with salt. Cook for 2 minutes or until thickened. Remove from heat. Assemble sandwiches: Spread garlic cream sauce on each inside slice of bread. Top one side with grilled chicken, 3 slices of bacon, and 2 slices of cheese (or ⅓ cup of shredded cheese). Top with other slice of bread. Grill sandwiches: Preheat a skillet over medium-high heat. Drizzle a little olive oil on one side of bread. Place that side down onto skillet. Press down using another skillet. Let cook until golden brown. Drizzle other side with olive oil. Flip it over, press down with other skillet, and grill that side until golden brown. Serve warm. Sounds good. I don’t have a panini maker, but I like your idea of using another pan! 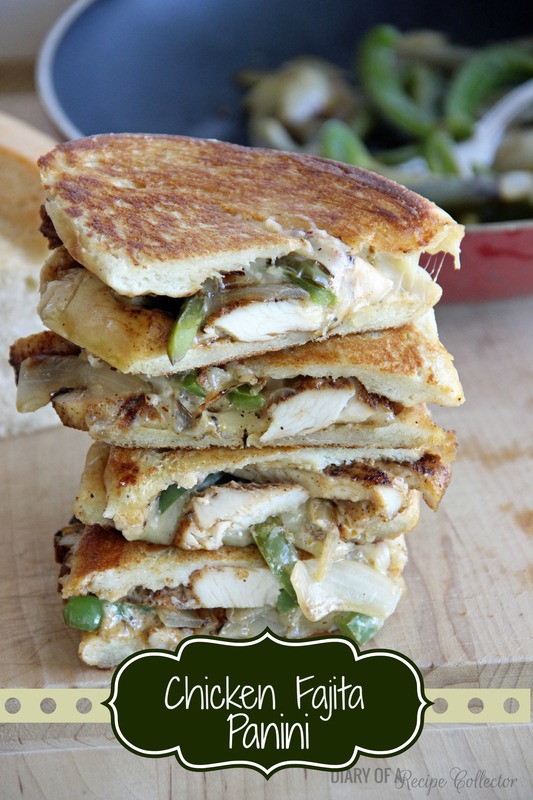 You just can’t beat a great panini, and I’m loving everything about this one. 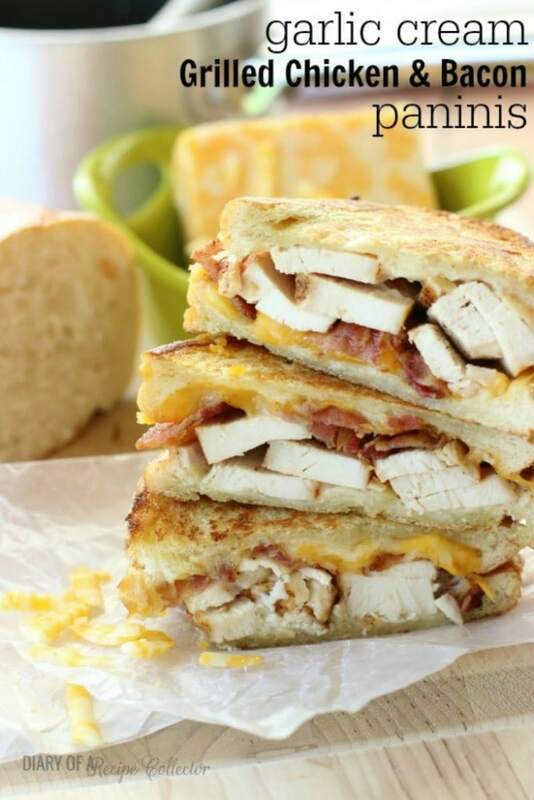 Bacon, chicken and melted cheese are always so good together. Oh my, these look insanely delicious! 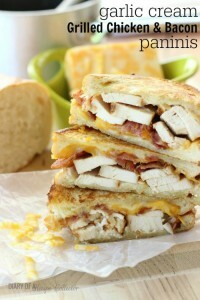 I love paninis and these look right up my alley! Oh I am loving the looks of this! I think I would eat that garlic cream sauce on anything! THOSE HUNKS OF CHICKEN!!! They’re calling to me! Did you say garlic cream sauce?! I think I could smear that on just about anything and be a happy camper. 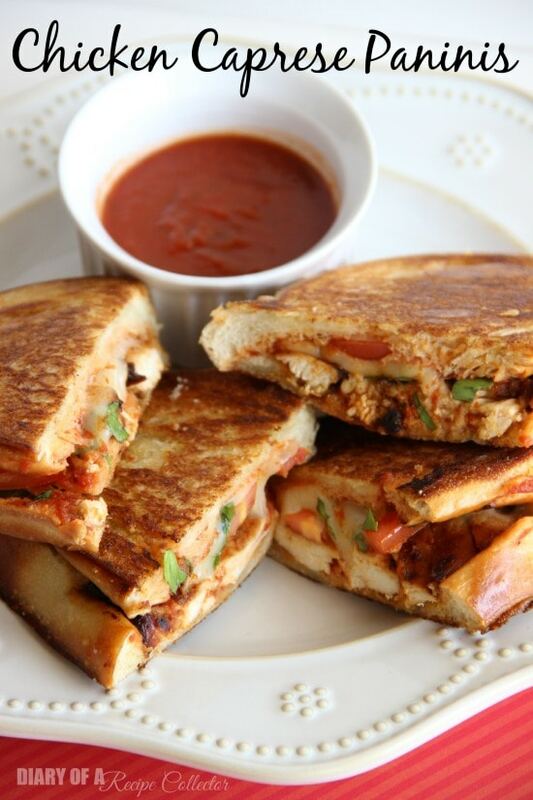 But especially these paninis! I’ve never made one before because I always thought you needed a special panini maker. I’ll have to try the pan on top trick! 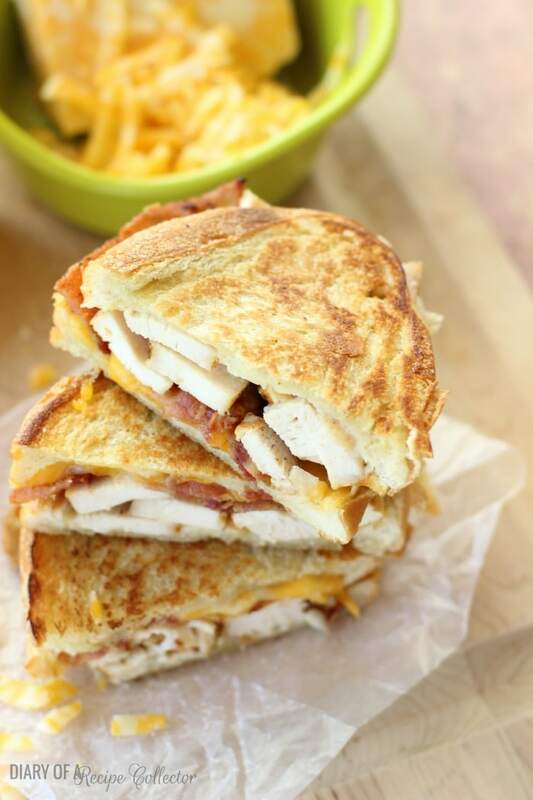 This sandwich looks awesome! 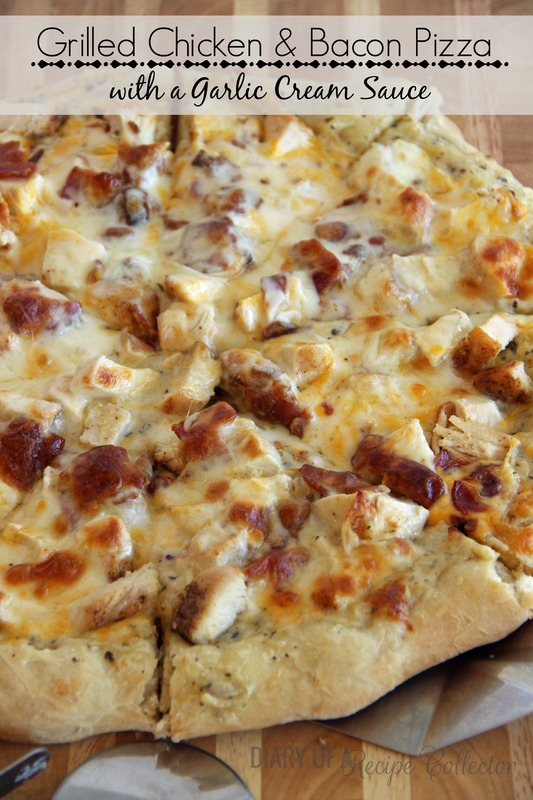 Garlic, chicken, bacon and cheese…..so good! This would be perfect for lunch! Love the bacon!